Originally posted by Bullet on Autopsy of Architecture on Sunday, March 27, 2016. 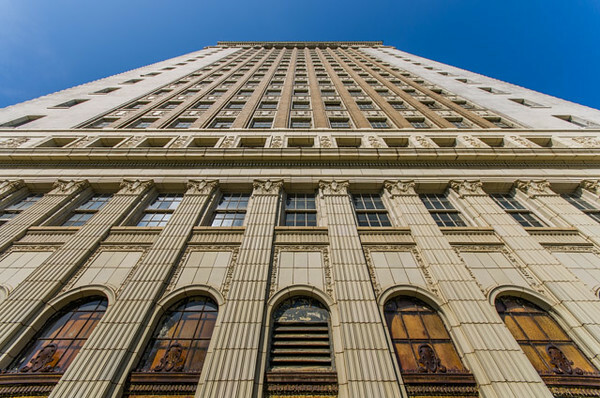 The Thomas Jefferson Hotel is a 19-story building, formerly a 300-room hotel, completed in 1929 at 1631 2nd Avenue North on the western side of downtown Birmingham. 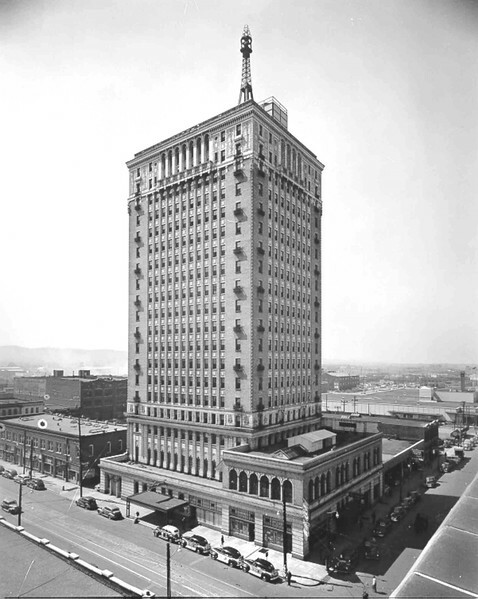 The hotel featured an ornate marble lobby, a large ballroom, and a rooftop mooring mast intended for use by dirigibles. The ground floor incorporated space for six shops and the basement included a billiard room and barber shop. The ballroom and dining rooms on the second floor opened out onto roof terraces from which the main tower rose. A Corinthian colonnade in glazed white terra-cotta set off the base of the tower, with the hotel entrance marked by a metal canopy. The fourth floor created an entablature, punctuated by the rhythm of windows that continued in brick for 13 more floors. The tower was capped on the top two floors with ornamented terra-cotta, including a balustrade and arched deep-set openings. The corners of the tower were clad in white brick to provide visual supports for the upper portion of the tower, while the narrow strips of brick between the windows were tan in color, each capped with a white acanthus leaf at the top. The edge of each corner was softened with a twisted-rope moulding, rising to a sculpted satyr at the top. The cornice rests on tightly spaced brackets with a shallow overhang of red mission tile suggesting a sloped roof. All rooms were air conditioned and provided with a private bath, radio, television and Muzak. The hotel operated a laundry and valet service and housed a coffee shop, lounge, pharmacy and barber shop. Nightly dinner dances were held in the Windsor Room. Other rooms available for events included the Terrace Ballroom, Jefferson Room, Green Room, Gold Room, Board Room and Director’s Room. In 1933, there was a $35,000 improvement project which removed the retail spaces and merged the empty space with the hotel, creating a larger hotel lobby with an electric fireplace. The dining room was expanded and a ballroom was constructed over part of the roof terrace. It was only the first of several renovations for numerous owners. In 1966 the hotel underwent another major renovation, this time at the cost of $500,000. The hotel was modernized with the addition of new carpeting, ice machines, stainless steel kitchen equipment and automatic elevators in anticipation of new business from the promised Birmingham-Jefferson Civic Center. Well past its prime, the hotel was bought by J. M. Glodt in the late 1970s. A large fire on November 26, 1980 broke on the ninth floor hallway, leaving many people trapped on the floors above because there was no fire escape. A smaller fire broke out on July 14, 1981, leaving some injured. These two events highlighted the building’s outdated safety systems. 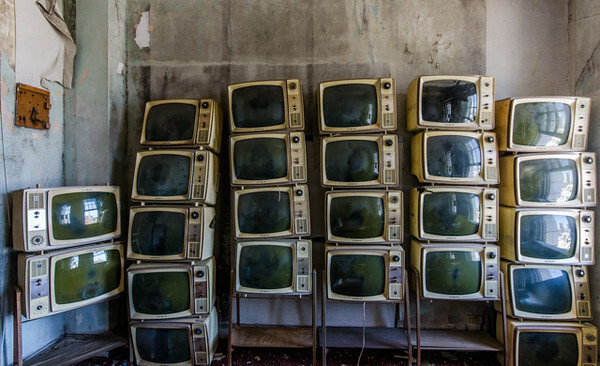 By 1981 it was functioning as a $200/month apartment building with fewer than 100 residents. Facing citations under new fire, electrical and life safety codes, the Cabana Hotel was closed down on May 31, 1983. 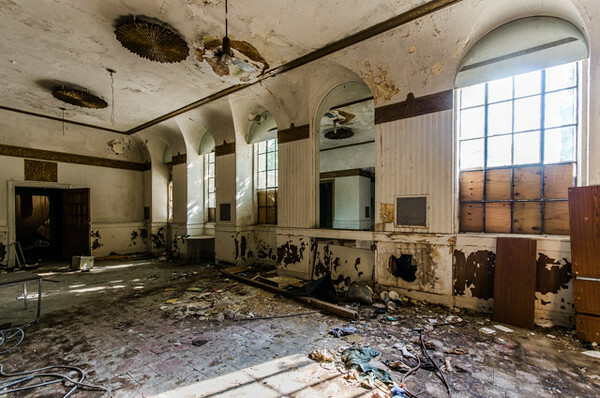 The deterioration of the interior was noted in 1987 when Sam Raine, Sammy and Norman Ceravolo prepared for a court-ordered auction of the building and its contents. They won the auction and repurchased the note for an amount equal to the outstanding debt. Sam Raine operated a computer repair shop in the corner retail unit of the building until his death in December 2003. In 2002, the property was listed for sale for $950,000. Architect Jeremy Erdreich estimated at the time that more than $20 million in repairs would be needed just to make it habitable. In 2005, the Leer Corporation submitted a $20 million proposal to convert the building into upscale condominiums, to be known as Leer Tower. The new building plans included a rooftop swimming pool and four condominiumunits per floor. Leer Tower Birmingham, LLC executed a mortgage with Sammy and Norman Ceravalo to partially purchase the property, and took out a second mortgage with Antoinette Raine, widow of the late Sam Raine, to complete the purchase of the property. They installed a new “Leer Tower” sign on the rooftop, which was first illuminated on August 30, 2007. The property went into foreclosure on June 27, 2008 on the second mortgage followed by a foreclosure on the first mortgage on May 27, 2009 and the property reverted back to its original owners. The building, left gutted by the Leer Corporation and without utility services, fell further into disrepair when an underground stream flooded the basement and vagrants began squatting on the upper floors. Shortly after the first foreclosure, Watts Realty Co., Inc. was enlisted in selling the property. In an effort to allow the property to be utilized in ways that could further the preservation interest of the property, Watts Realty began allowing third-parties access into the abandoned building, which is also how I was able to gain access to it. On July 16, 2012, Watts Realty stopped allowing visitors into the building after someone BASE jumped off the roof the hotel, further securing the property to prevent access by unauthorized persons. In August 2013, the property was purchased for $1 million by TJTower LLC, headed by former basketball player Brian Beshara. His group’s plan includes converting the upper floors into 96 apartment units and around 7,000 square feet of retail space and restaurants. The building will also feature a main dining room and kitchen on the second floor that will utilize the terrace and historic dining room space. The projects also includes event space and a small theater for residents. The rooftop zeppelin mooring mast is the last of its kind in the world. Unused throughout the years, it deteriorated and the top portion of it was either removed or fell off sometime in the 1950s. Stewart Perry Construction who are in charge of the restoration declared it is their mission to rebuild the missing piece and to light it as a modern symbol of the City of Birmingham. They plan to install an LED lighting system which can be controlled remotely to be able to change the color or intensity of the lighting.